The Spaceships Milky Way Soap Mold features two different styles of spaceship commonly associated with aliens and journeys into outer space. These fun, retro designs capture children's imaginations and make bath time fun! 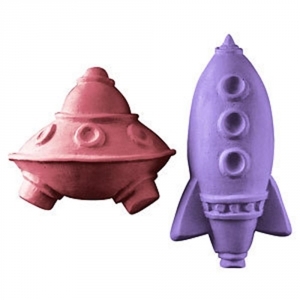 Rocket: 4.5" x 2.5" x 1"
Saucer: 3" x 3" x 1.25"
Notify me when Spaceships Soap Mold is in stock.